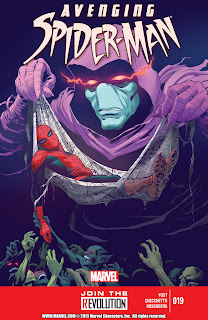 This week for our written reviews it was a heavy week for Marvel NOW! Only one of the books was covered on the Comicast. Enjoy our reviews of Wolverine #2, Uncanny X-Men #4, Secret Avengers #3, Fearless Defenders #3, Avenging Spider-Man #19, and Avengers #9. The art truly is rather stunning. This artist excels at facial expressions. The colors are powerful. I'm glad that the initial antagonist never stopped being such as revealed at the beginning of this issue but its unfortunate how and how long it took to get us to this point. Ex Nihlo has tampered with the system, with Earth. He has created new, sentient life on Earth. It's up to the Avengers to work with Adam, a man created by Nihlo, and Kevin, who is a product of Nihlo's latest deception. 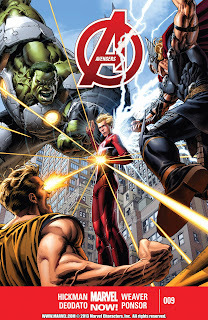 It also seems that New Avengers and this title are finally starting to cross over with the appearance of something that has been shown in New Avengers that is presented at the end of this issue. This story feels like its snailing along. I would imagine that the pace that this story is going that this title would be exponentially better as a trade. The art instantly captivates with its unique, brilliant design and structure not to mention the gorgeous and slightly eerie style. It's nice to see Peter actually fighting Octavius for his body back rather than just whining and complaining about it. This issue does something that no other issue has been able to do, make you feel sympathy for Otto. It still irritates me that Octavius somehow still has access to his old body's memories but trouble doing the same with the body he's in. Pretty quickly you figure out that he's having some sort of nightmare which turns out to be a sleepwalking/fighting nightmare. A parasitic creature from another realm is fighting for control over his body. Luckily he gets help from a man whose responsible for hunting these things down. In the end it's Otto that finds the strength within himself and his superior firm to defeat the parasite and his worst fears. The lessons that Otto is learning almost makes me hope that Peter and Otto become allies after all of this. Albeit Octavius is still an ahole but it was kind of nice to see him triumph against his fears. The art is awesome and gorgeous and the writing is impressively well done. 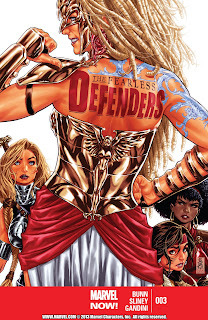 Nothing says cover of the week better than a goddess with a back tattoo. Second of all the intro/info page was awesome and much needed after last issue. For the first five pages it goes deeper into this whole Doom Maidens Valkyrie thing. Hela and the All-Mother come to an agreement that this group of rag-tag females will be temporary solutions to the lack of Valkyries. Then some crazy lady with mommy issues follows through with her revival of the Doom Maidens. The defenders are transported back to Midgard from Asgardia to locate Dani Moonstar only to find that they are too late. There's somewhat of a shocker at the ending that reveals that one of the fearless may be a Doom Maiden herself. It's always disappointing to find that the interior art is not the same as the cover art but I won't deny that Sliney does a solid job at getting it as close as possible. Its always great to see the artist switch up or add another style with a memory or flashback. The story is pretty slow but not without some action and intense moments to pick it up. I'm still enjoying this all female team book as its fun, witty, and interesting. I like the art but the feel of the book isn't right. It feels wrong, inappropriate. Nick Fury & Daisy Johnson go to what looks like a weapons expo. The way they act and talk to each other seems very unprofessional and inappropriate. I can't help but feeling like not only is this a completely different Nick Fury but SHIELD as well. 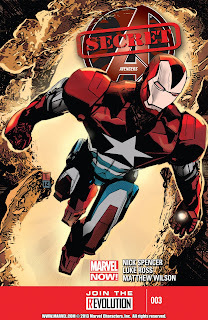 The government presents the newly repurposed Iron Patriot armor as AI drones. AIM shows up to the party but not exactly as you'd expect. This turns out interestingly as much as it is unforeseen. Maria Hill briefs Hawkeye, Black Widow, and Mockingbird on their new mission with Phil Coulson to get intel on the new AIM. They come across an interesting find. As much as this title is turning out to be more of a comedic new age phase 2 marvel book than a gritty noir spy genre type it didn't end that way. I feel so torn about this title because there's certain things that are spectacular about this book and others that bug the crap out of me. I enjoy and appreciate the art as it is almost that of a sketchy noir style but not quite. Part of this book felt like a repeat of what happened in the last issue of All-New X-Men. What this book did different was expand and explain why the Stepford sisters decided to join Cyclops at his Xavier school, and yes he's that effed up to call it that. 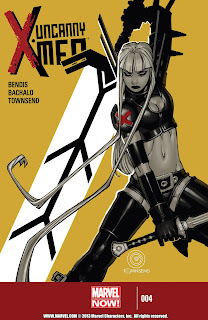 This is also when we begin to see how Magik is being affected by the Phoenix Force. The original x-man that joined Cyclops group is revealed as well. I'm kind of disappointed who it was but I will have to wait and see how it plays it out. I like the dialogue, didn't care for the rehashing, and the art seems to be less impressive with each issue. First off the art isn't as good as the first issue which is always disappointing to see. The beginning made no sense me and I have no idea how it did or will contribute. Logan continues his search for the little boy that keeps shooting alien technology at him. 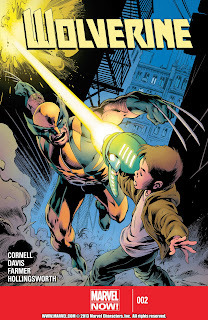 It's kind of cool to see how badly Wolverine gets messed up by the alien gun this kid is wielding. Not much happens in this book. Logan gets closer to figuring out what's going on. Then SHIELD shows up and an important sight see-er. The dialogue and art are well done but not quite on par where it could and should be.